Immigrants are characterized on the average with higher human capital and are rewarded potentially less as compared to their native counterparts. This question has motivated me to analyze the immigrants-natives wage gap in detail and find the extent of this potential discrimination against the immigrants. 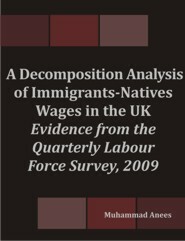 I analyze the data from the first two quarters of the Quarterly Labour Force Survey, 2009 using the Oaxaca Decomposition technique. Applying both the threefold and twofold decomposition approaches, I computed the wage gap first using simple decomposition based on threefold and then the twofold approaches using both coefficients of the native model and coefficients of the pooled model as weights separately. My findings from these computations are that immigrants have on the average higher human capital endowments and their rewards are not at least the same with the rewards for natives. This suggests discrimination is present to some extent against the immigrants otherwise they would have earned than what they earn at their current level of education, experience and other characteristics. Muhammad Anees is Assistant Professor at COMSATS Institute of Information Technology, Attock, Pakistan.